Harrison was the Monster Detective, a storybook hero. Now he's in his mid-thirties and spends most of his time popping pills and not sleeping. Stan became a minor celebrity after being partially eaten by cannibals. Barbara is haunted by unreadable messages carved upon her bones. Greta may or may not be a mass-murdering arsonist. Martin never takes off his sunglasses. Never. No one believes the extent of their horrific tales, not until they are sought out by psychotherapist Dr. Jan Sayer. What happens when these seemingly-insane outcasts form a support group? Together they must discover which monsters they face are within--and which are lurking in plain sight. 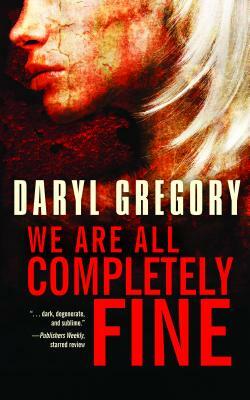 Daryl Gregory is the award-winning author of We Are All Completely Fine, Pandemonium, The Devil's Alphabet, Harrison Squared, and Raising Stony Mayhall, which was named one of Library Journal's best books of the year. His comics work includes Planet of the Apes and Dracula: The Company of Monsters (with Kurt Busiek). His forthcoming novel, Spoonbenders, is a comedic tour de force starring a family of misfit psychics. Gregory lives in Oakland, California. "Daryl Gregory [is]...a writer of startling depth and sensitivity, whose understanding of the delicate machinations of the heart trumps his need for superheroes, or even for neurology." "More than many novelists, Gregory’s work not only withstands but grows richer with re-readings and sustained attention."